Search funds are one of the most exciting asset classes in private equity today. Returns have been in excess of 30%, and even excluding the top performing funds, IRRs are in the high 20s. 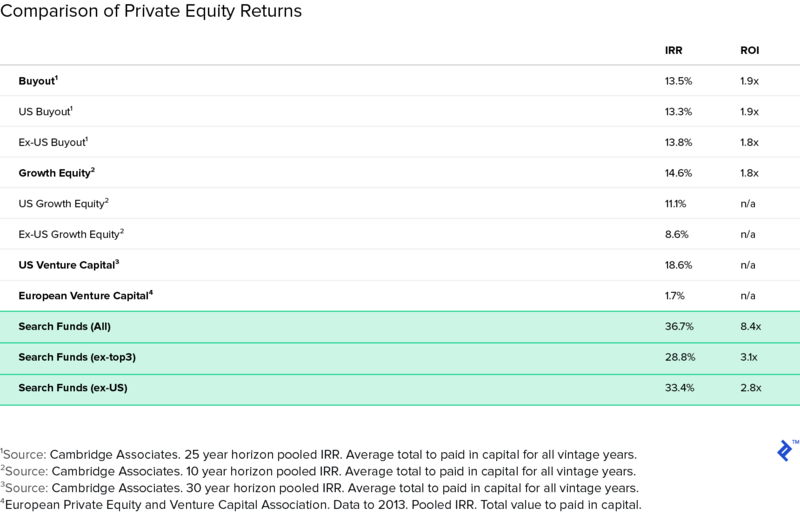 Compared with other similar asset classes in private equity, such as venture capital, growth equity, and buyout funds, search fund returns are often superior by 10-15%. Search funds allow investors to put money to work in three different stages. 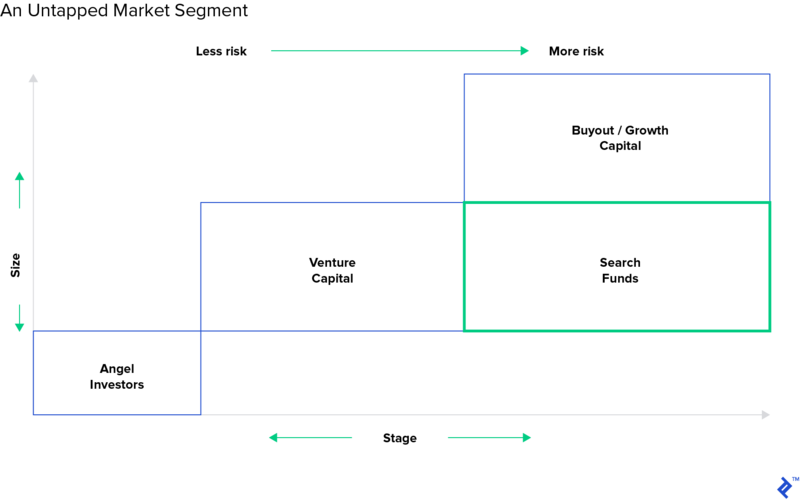 As a reminder, the search fund model can be divided into four general stages: the search stage, the acquisition stage, the operational stage, and the exit. Of these four stages, investors have the opportunity to invest in the first three. Investors who invest in the search capital receive two key benefits: pro-rata follow-on rights, and a stepped up conversion (usually at 150%) into the securities issued during the acquisition. Acquisition financing is usually structured as participating preferred stock, with preferred returns of 5-8% and a 1x liquidation preference. Depending on the operational strategy of the acquired company, investors may have further opportunities to invest in bolt-on acquisitions or other growth strategies. This allows them to double-down on the winners, enhancing their returns. Search funds allow for greater diversification of portfolios. The low interest rate environment has driven investors towards alternative asset classes, of which private equity remains one of the most significant. Search funds allow for greater diversification of private equity holdings since the companies targeted differ in fundamental ways from the types of companies that venture capital, growth funds, and buyout funds invest in. Active investors can add significant value through their participation. Compared with growth and buyout investing, investors can play a far more active role in their search fund investments, adding value through their operational and deal experience. The search fund model is in fact predicated on a strong symbiosis between the searchers, the company/industry, and the investors, who support the talented but inexperienced CEOs in their journeys. Ori’s article took the perspective of the entrepreneur and did a fantastic job at running through the workings of the model, and the pros and cons of going down the search fund route vs. the more well-known startup route. For aspiring entrepreneurs who lack an idea and perhaps don’t have quite the same level of risk appetite that startup founders have, a search fund is an excellent way of pursuing the entrepreneurial dream. But as with startups, investors play an important role in the search fund model. In fact, the key distinction between the search fund model and an unfunded search for a company to buy is precisely the support of investors during the search phase. But to this end, convincing investors to give you half a million dollars to pay yourself a salary as you search for a company is not such an easy task. The motivation of this article is to complement Ori’s article, which was written from the perspective of the entrepreneur, by looking at this asset class from the investors’ perspective. Despite a significant uptick in activity in recent years, search funds still remain a relatively unknown asset class. Few investors have heard of them, and even fewer have invested in them. But a closer look at this acquisition vehicle suggests that search funds are arguably one of the most exciting asset classes in private equity today. Of the four stages of the search fund model outlined in Ori’s article, investors can put capital to work in stages one to three: the search capital, the acquisition financing, and further investment opportunities during the operating phase of the company. The purpose of the search capital is to fund a search of up to 24 months for a company to buy. The use of funds of the search capital will depend on the specificities of the search fund in question, but the table below provides a general overview of the types of costs incurred during this stage (please note that the indicative figures below are for a solo-searcher). As mentioned, the exact amount raised will depend on the particular circumstances of the search fund in question, but generally speaking, the figures tend to be within a range of $350,000 to $500,000. 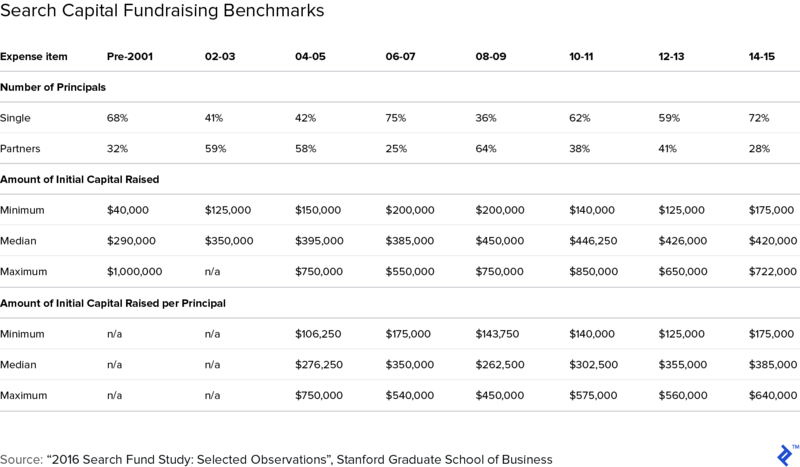 The table below provides a summary of the amounts raised and other relevant metrics for the search phase in the last few years. Legally, the search fund almost always gets structured as a Limited Liability Company (LLC). This means that investors buy units of the LLC (as opposed to shares/securities as is the case with a C-Corp) when they choose to invest in the search fund. The size of the units is up to the searcher to define, but typically searchers target 10 to 20 investors meaning that the units need to be sized accordingly (typically $35,000-$50,000. N.B. Investors can also buy half units rather than whole units). The first clause, in particular, is a very important benefit for search fund investors since it allows for a try-before-you-buy situation in which investors can really diligence the quality of the searcher prior to the acquisition financing round. Assuming the search is a success and an acceptable target is identified, the searcher proceeds to a detailed diligence and negotiation phase which, hopefully, results in a formal acquisition offer for the company. The acquisition capital package must be put in place prior to the acquisition offer, and here is where investors once again enter the picture. 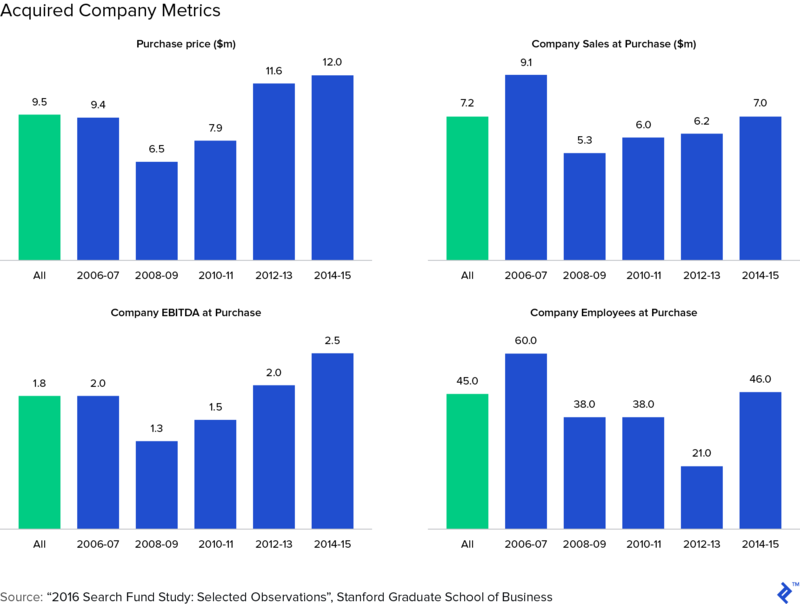 To get an idea of investment size, the often-cited benchmark is to target companies with $10 to 30 million in revenues and EBITDA greater than $1.5 million. Having said that, purchase price statistics show that average deal sizes are usually smaller, trending towards the lower end of that range (and sometimes even below). 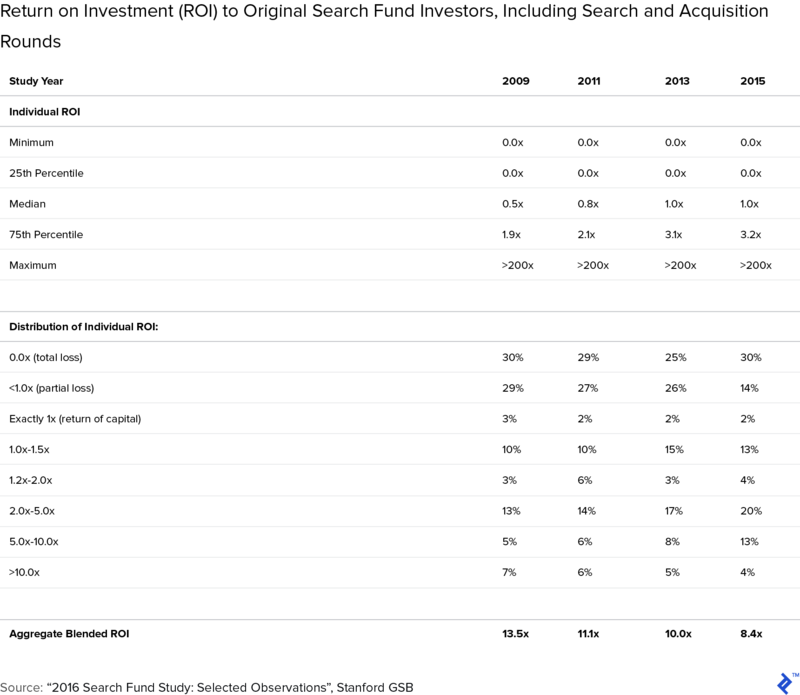 Most search funds acquire companies for around $10m in value. The acquisition capital can come from a variety of sources. Bank debt is an obvious source, as are other specialized providers of financing such as mezzanine debt funds. Another commonly used financing source is seller financing, which simply explained means that the seller accepts to be paid using future cash flows of the business (e.g. an earnout). But of course, a major source of capital for the acquisition is investor equity, usually provided by the same investors that invested in the search capital (given their right of first refusal). It does happen that initial investors decide not to follow on (a recent Wharton article mentioned that 10% of investors don’t follow on), and in these cases, the equity gap can be plugged by new investors. Preferred return: Most often, the preferred shares will carry a preferred return coupon (recently in the range of 5-8%). Participating preferred: Most search funds, especially in the U.S., will issue participating preferred equity, usually with a 1x liquidation preference. For a more detailed explanation of the mechanics of liquidation preferences and participation rights, check out Toptal Finance Expert Alex Graham’s fantastic article on important term sheet clauses. Redemption rights: Preferred stock can sometimes be issues with redemption rights, meaning that investors have the ability to redeem their shares prior to a liquidation event. While initially most search funds used non-redeemable preferred equity, in recent years there has been an increasing number of search fund acquisitions done using a combination, as outlined in greater detail in the Stanford search fund primer. Partnership typically earns 30 percent of the common equity while solo searchers earn 20 to 25 percent. For LPs often the most dramatic investment gains can be realized through direct co-investment alongside the fund into portfolio companies. The unique two-stage investment process attending Search Fund affords this option better than other private equity fund investments: first, at the point of acquisition there is an opportunity for co-investment, and second, at future points when the acquired company needs growth capital, there are further opportunities for direct investment. The ability for further capital outlays in the operations phase is important, because it allows investors to double-down on the investments that are performing well, a concept which was well-described in a recent article by Toptal Finance Expert Alex Graham. With all the above in mind, it’s helpful to run through an example of a search fund acquisition to get a better understanding of how the economics work for investors. The example uses three different scenarios: an upside case, a base case, and a downside case. 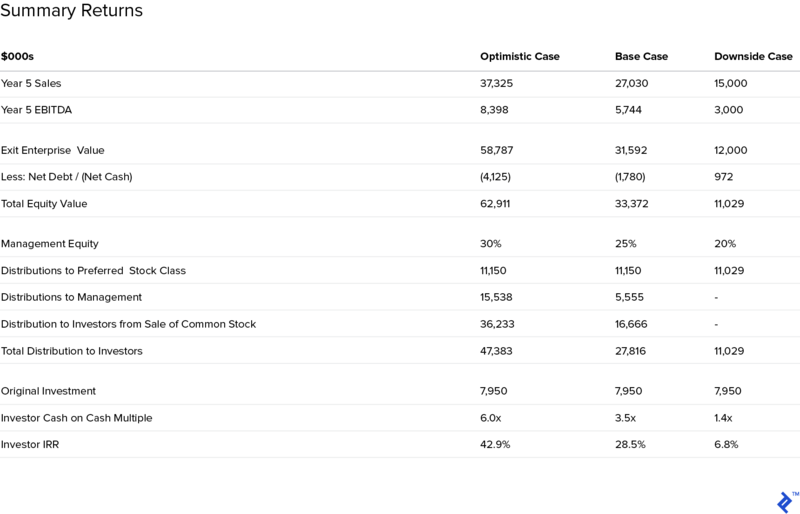 A summary of the assumptions in each of these cases is in the table below on the left. Up to ⅓ (10%) vests according to net investor IRR performance hurdles. Vesting is usually straight line after 20% IRR but for the purposes of our example we’ll do it as follows: 50% vesting at 27.5% IRR, and 100% vesting at 35% IRR. Below is a summary of the returns for investors in each scenario. Those interested in seeing a more detailed breakdown of the model can do so here. Having gone through the mechanics of search funds from the investor perspective, we can now turn to a discussion of the benefits of investing in search funds. I see essentially three main benefits. The first and perhaps most important reason why investors should consider investing in search funds is that the returns for the asset class have been very high. Recent studies by Stanford Business School and IESE Business School show that the asset class as a whole has been generating returns well in excess of 30%, and even excluding the top three funds, returns have been in the high twenties. These are impressive numbers, particularly when compared to other similar asset classes in the private equity category. Compared with venture capital, growth equity, and buyout equity, it’s pretty clear that search funds are one of the highest, if not the highest, performing asset class in the private equity sector. In fairness, it has to be recognized that these returns are quite skewed by the highest performing funds and that the distribution of returns is not so smooth. As the table below shows, the median return is in fact 1x, and that only 30-40% of search funds return more than 2x investor’s capital. Nevertheless, investors with a smart diversification strategy should be able to combat negative outlier performance and capture higher risk-adjusted returns. 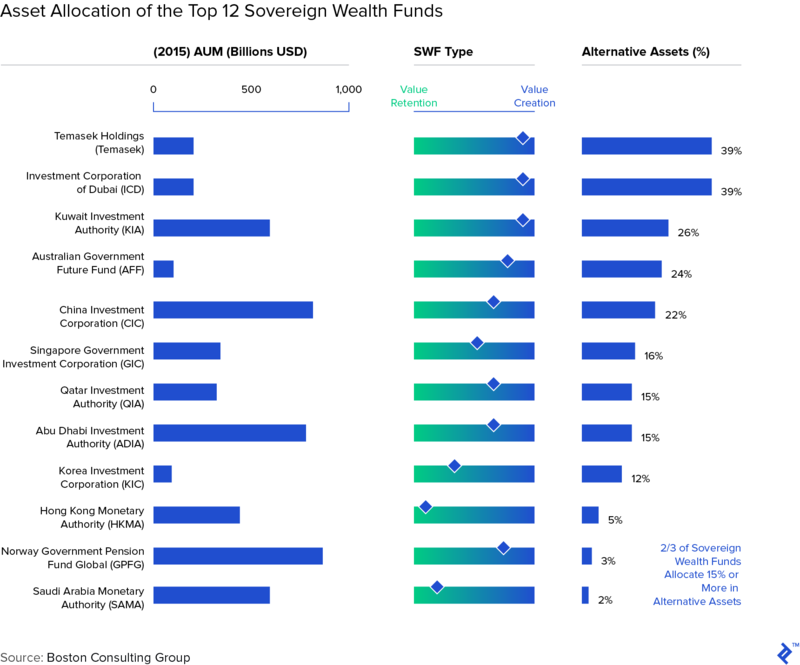 In the current low interest rate environment, the hunt for yield has driven investors, even the most traditional ones, towards so-called “alternative assets”, as can be seen in the charts below. 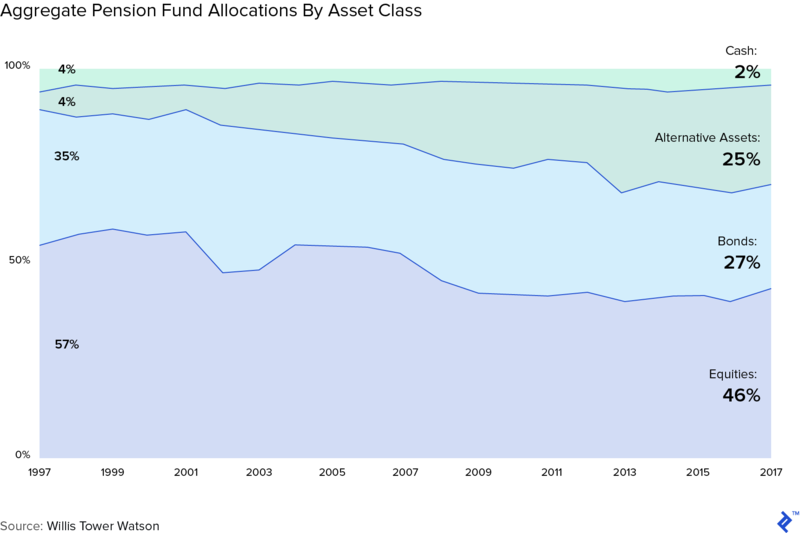 Within alternative assets, private equity continues to be by far the largest “bucket” of investment allocations, with buyout private equity attracting the largest share. Search funds are therefore a very opportune way of diversifying portfolio holdings of private equity, and, depending on the ticket sizes of the portfolio in question, allow for a greater number of a investments given the smaller ticket sizes. 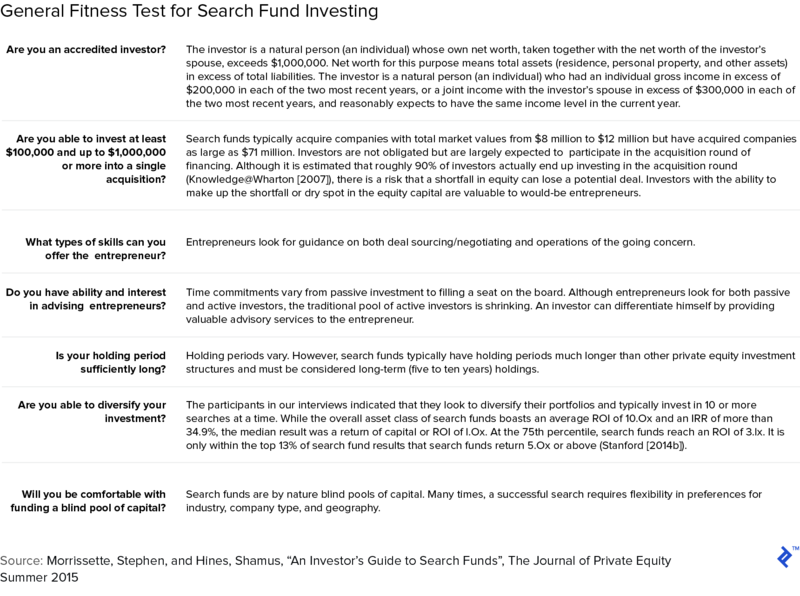 Search funds target different companies from other common asset classes in private equity. Search funds purchase companies that are already established and profitable, and that have often been around for many generations, thus differentiating them from venture capital. These companies are, however, much smaller than the types of companies that larger private equity funds would look at, making them fundamentally different and less correlated to the assets in PE funds’ portfolios. Another reason why search funds may be a more attractive investment than other related private equity asset classes is that the compensation and fee structure of search funds is arguably better aligned with performance. 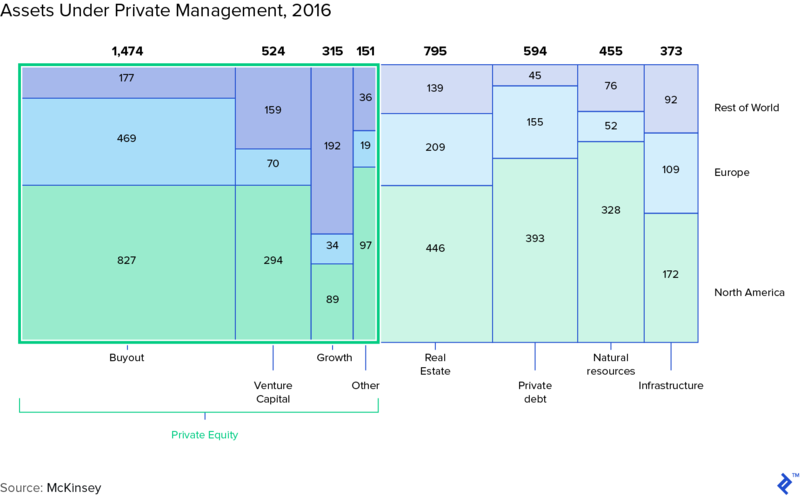 As the table below shows, venture and private equity funds usually charge management fees, something which has been increasingly criticized in recent years, and which arguably skews manager incentives. A natural consequence of management fees, for instance, is to target larger and larger funds. Moreover, management fees are not tied to the performance of the underlying assets. Search funds do not charge management fees, and rather most of the compensation for the searcher is tied to the eventual exit of the company. The all-in cost to investors is also often lower. For investors looking to play an active role and add significant value in their investments, search funds are an excellent asset class to put money to work. As many readers will know, access to larger deals in growth or buyout equity is now usually only available via institutional funds, who often limit opportunities for co-investment and in any case curtail the ability of the LP to get very involved in the portfolio companies. Moreover, these are usually much larger deals where board seats are hard to come by. This may be desirable for those looking to invest passively, but, on the other hand, limits the amount of value that investors can add to a deal. The importance of the investors and the board is illustrated clearly in the chart below. 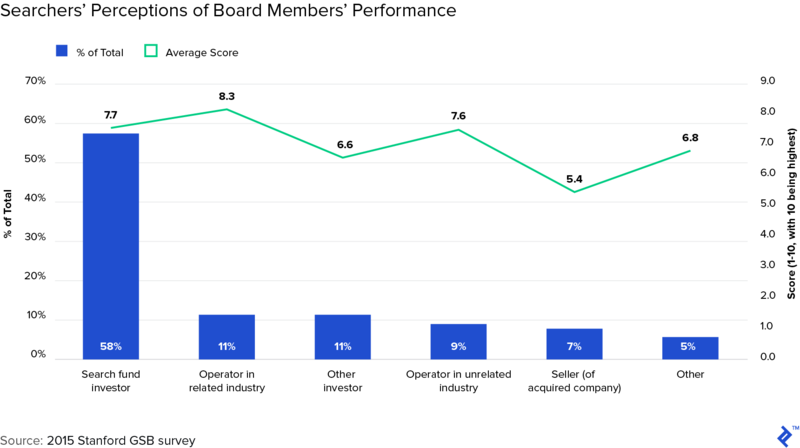 As can be seen, both search investors as well as board members with operational experience (who often come via the initial investors) are highly valued by the searchers. Are Search Funds Right for you? As I’ve tried to show, search funds are arguably one of the most exciting niche asset classes in the private equity space, giving investors the chance to make very significant returns and play an active role in sustaining younger entrepreneurs. Many investors have become very rich from investing in the asset class, and it is, in fact, no wonder that there are now several dedicated fund of funds for search funds, which have institutionalized the model and made it easier for would-be searchers to raise capital without an excessive time commitment to the fundraising process. Having said that, there are certain aspects of search fund investing which must be kept in mind. Firstly, search funds remain highly risky and illiquid investments, so investors should firmly allocate them in their alternative assets portfolio allocations (usually limited to 5-15% depending on risk appetite). Moreover, given the relatively limited number of search funds, particularly outside the US, creating a diversified portfolio of search funds can be challenging. Search fund investors who have had significant success investing in the asset class report trying to invest in up to ten different search funds at a time. Finally, an often underappreciated aspect of search fund investing is the scale. Initial commitments in the search capital are small ($35,000-50,000) but these should really be viewed as options to invest in the acquisition capital, which will often reach several hundreds of thousands of dollars if investors follow-on pro-rata. Potential search fund investors must, therefore, be mindful of this in the perspective of their overall investment portfolio allocations. Below is a handy checklist from a paper by the Chicago Booth School of Business that would-be search fund investors can use to think through the potential of putting money to work in the asset class. A final aspect worth remembering is that as with any early-stage investing, there is often a non-financial component that is significant. For many search fund investors, supporting young, hungry, aspiring entrepreneurs in the pursuit of their dream to lead and manage a company and create lasting impact is a fun and fulfilling activity. Many search fund investors were once searchers themselves who through luck, hard work, and support were able to achieve their entrepreneurial ambitions, and so are now keen to give back to the community. This is why the search fund community is so tight-knit an collaborative. With this in mind, potential new investors may want to think about whether this non-financial aspect is important to them rather than just purely the financial returns. A Search Fund is an acquisition vehicle that on the one hand allows aspiring entrepreneurs to search for a company to buy and run, and, on the other hand, allows investors to invest in smaller but very high-performing companies that have significant return potential. An aspiring entrepreneur will raise a modest amount of search capital to fund the search for a company to buy. When the company has been found, the search capital investors have the right, but not the obligation, to finance the acquisition of the target company.